Moose is on the loose and in a big hurry! From the creator of Follow that Car comes another inventive, interactive and hilarious picture book. A moose is on the loose and in a serious hurry! As he rushes through town, Moose is chased by an ever-growing crowd who are anxious to retrieve all the things that catch on his antlers. He dashes through a swimming pool, a museum, a classroom and even a castle! But where is he off to in such a rush? Hang on, it's a PARTY! Of course! But why is Moose looking so anxious? Uh-oh. Do you think he's forgotten to bring a present? Watch out everyone! Moose is off AGAIN! Lucy Feather isn't a real person. It's the nom-de-plume of members of the editorial staff at Nosy Crow, who often write together with a lot of good humour, tea and chocolate. Stephan Lomp is the illustrator of Follow that Car. Sometime during primary school he decided he wanted to be an illustrator, so Stephan started making his own comic books and painting pictures for his friends. As an adult, Stephan spent many years working for ad agencies, web agencies and event marketing companies, doing character design and editorial illustrations. Then, in 2009 his first picture book was published. Recently, Stephan has illustrated for several publishers in Germany, Spain and France. He is now working on his own stories, which he can't wait to illustrate. Stephan lives in Dusseldorf, Germany. Out of the forest and into the city rushes moose. Clearly in a very big hurry, he races through the fire station, around the department store, into the library, in and out of the museum, around the supermarket and even through the hospital! Even a castle, a swimming pool and a school don’t deter him – he must get where he’s going NOW! Up the stairs into the City View Apartments – up, up, up to the roof terrace where there is a - big birthday party. And just as he gets there it’s present-opening time. But wait! Why is Moose so unhappy? Oh no! He forgot to bring a present… and off he goes again. This is a fun picture book written by the editorial staff of Nosy Crow under the pen-name of Lucy Feather. 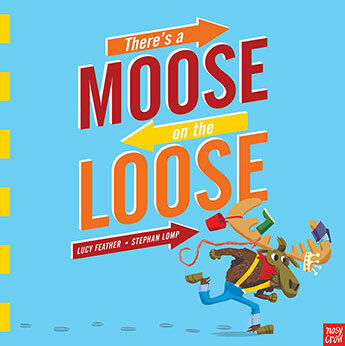 The text is directed at the reader encouraging them to join in by following the arrows and looking for the objects that collect on Moose’s antlers and those who join in the chase wanting to reclaim their things. The big bold double-page spreads are full of colour, movement and detail that encourage closer examination once we’ve learned just why Moose is in such a hurry. Pre-schoolers will delight in being able to re-read this book all by themselves because after that first read, the text is not really necessary. Putting on my teaching hat, I love that Moose’s journey and the arrows for the children to follow reinforce that left-to-right progression of reading helping the eyes make that sort of track a muscle memory while also encouraging visual acuity with so much to see and find within the illustrations. Stephan Lomp has created a wonderful world of interactivity with his energetic style, crazy animal antics, and bright, lively colours. This book definitely has a place in your preschool collection and the shelves of those just learning to read.